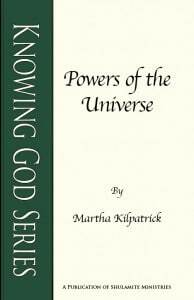 Powers of the Universe is now available in both print and digital format. I wonder if you understand that the whole world is in a state of continuous war. Your world. My world. This endless conflict of the world is over power. Who has the power? You are engaged in this conflict. If you are in your kitchen, you are engaged in this conflict. If you breathe, you are affected by this conflict. In the work place, in the home, wherever you are, you are a part of this struggle. You are either a pawn of the struggle or you are the instigator of the struggle. And the question is always: Today, this moment, who is going to have the power? Who is going to have the control over a situation? We believe, we think, we are above a power struggle and we are not; no one is above it, and no one is immune. Have you ever been in a power struggle with your children, spouse, boss? Each of us has an internal view of the powers at work around us. We have an unconscious concept of those powers and we live by it. Each of us does. The problem is, we don’t know that we have this concept—and we don’t know what it is. We believe there is a specific allotment of power to different forces in the world. In other words, in a given situation, we believe this power or that power rules. Now you might be able to spout some good doctrine and say, “Well, of course, God rules everything.” But the question is: how do you live and think and who are you in your heart regarding the powers at work in the world today? The whole universe is a conflict over power. Satan has a measure of power. Man has power. The question is what, in your real self, do you believe? How much power is given to each one? I knew for a long time that much of what I heard about spiritual warfare was not right, but at the time, I didn’t know what was right. I would always have this question: If Satan is defeated utterly by the cross, why are we fighting for his defeat? And I observed that people didn’t win. That was one way I knew it didn’t work! I knew there was something wrong in the way most Christians perceived warfare. This is what it is: Suppose a car pulled up to my house and a man the size of Arnold Schwarzenegger got out and came to my door and demanded my house. Even if I locked the door, he could come through it. Let’s say he comes in my house, proceeds to throw my furniture out, and I start to wrestle with him. What would happen? I wouldn’t make it past the first punch! I cannot fight him; he is too much for me. He can throw me out of my house and he can throw my furniture out. He can even move his furniture in. If I try to get out the front door, he can push me down the steps. If I wrestle with him, I am beaten! But, you know, it is very simple. I do not wrestle with him. What do I do? I do not have to wrestle with the strong man! He is too much for me. His tactics are too skilled. I cannot handle him. But on my legal ground, I have every authority of my county, my state, and if need be, my nation. Because I am standing on my legal ground, I do not have to push him out the door. I could even walk away and say to the intruder: “I’ll see you later,” and go across the street and call. I stand on the legal ground. For we wrestle not against flesh and blood but against principalities, against powers, against the rulers of the darkness of this world. We have misinterpreted that verse. That verse does not call us to wrestle anything. You can look it up! It does not call you to wrestle. When we wrestle it IS with principalities and rulers of darkness. Yet the scripture doesn’t call you to wrestle. What does it call you to do? Wear the full armor and…Stand (v. 13). And that is what I would do with Arnold—I would just stand on my legal ground, and I would have all this tremendous power behind me…standing on my legal ground. Until you understand that Satan legally has: no right, no power, no place, no claim on you, just because you are in Jesus Christ. You will wear yourself out fighting him—and he will win. But when you stand on that legal ground of the Cross, you have conquered him! Because all the power of the universe and the authority of the universe stands behind you. No one can be Jesus’ disciple who does not give up all his possessions, because any hold on any thing, or any person, is an illegitimate hold. The earth is His by right of creation and now it is His by legal ownership. In this world you will have tribulation. But be of good courage, I have overcome the world. When the Son of Man comes will He find faith? That is the question. That is a probing question. He is coming! His is a hidden Lordship—and your life turns on how much you believe that He is Lord. Your whole world turns on whether you understand that He is God. He owns all! He rules all! You can see this in David’s life. David was anointed to be king, yet Saul was the usurper for many years. Only the discerning people followed David. There was nothing obvious to indicate that David was ruling. He was hounded in captivity and disdained; he lost his reputation and was considered an enemy, but he was still king. That is a picture of the Lord Jesus in this age. He is King! And if you believe that He rules, you will see Him rule. It is your heart belief in the division of powers that determines whether or not you have faith. See why it is so important? When the Son of Man returns to earth, He is not going to be looking for numbers. He is going to be looking for faith because faith produces – and only faith. Only faith brings into reality what faith believes. Faith is not something you attain to—I used to think it was. I wanted to “get hold” of faith. But I have learned by experience that faith is something that you are reduced to. God reduces everything else you trust until you have nothing but HIM. You only arrive at faith by despairing of every other source and hope. At least that’s how I come to faith, over and over, by loss of faith in all else. Somebody else may have been able to master it. Not for me. No, I had to BE mastered. The Scripture is packed full of assurances that God is really God. He really is in absolute and total control. “From Him, through Him, and to Him are all things.” God is GOD. That is all that needs to be said. He is God! God has a purpose and He is not obligated to explain His purpose to anyone. He does not need to justify His actions. He can do as He pleases because He is God. Everything in your life has a purpose. I want to mention here an important book. It was written by a Jewish man named Viktor Frankl, entitled Man’s Search for Meaning. It is one of the most significant books of the 20th century. Its message is profound. Viktor Frankl was a young medial student imprisoned in both Auschwitz and Dachau concentration camps during World War II. He began a search in those terrible days to understand why two men in the same conditions, with the same food or lack of it, and the same physical abuse, would experience different outcomes: one would die and one would live. Frankl and others became able to look at a person’s face and know when he or she would soon die. Once a person reached that certain look, nothing could bring him back. Frankl wanted to know the secret of survival he was witnessing—he knew that if he could discover why some survived, he would understand a great secret to living. Viktor Frankl discovered that all suffering has a purpose and if you can believe that, you will live through your suffering to discover the purpose. But if you are suffering and you believe it has no purpose—you will die in the suffering. In his worst hour, Frankl could feel the temptation before him to die. He wanted to get out of his suffering. Frankl suffered horrible physical torture and there were times he could feel himself losing a reason to live. But he determined to believe even then, that there was a purpose for his suffering. He envisioned himself living beyond the misery to understand its purpose, and he saw himself teaching this secret of survival to large crowds. Not only did he survive and fulfill that very vision, he helped—and is still helping—millions. To believe life has meaning and purpose is to believe that God rules life. It is a view of life that is very hard to hold and believe. When pressures and trouble and difficulties come to you, there seems to be no purpose. It takes work to believe and hold on. God will have the final word. He is my mighty God. He will have the final word! And even those who hate me will produce praise in my life. Even those who do you evil—if you believe—will produce praise for Him. The wrath of man shall praise Him. He is that big. He is that awesome, that transcendent! No one can thwart God. That is what kind of God you have!